I'm so totally stoked that my Baker's Rack arrived a whopping SIX DAYS earlier than estimated! Yay! 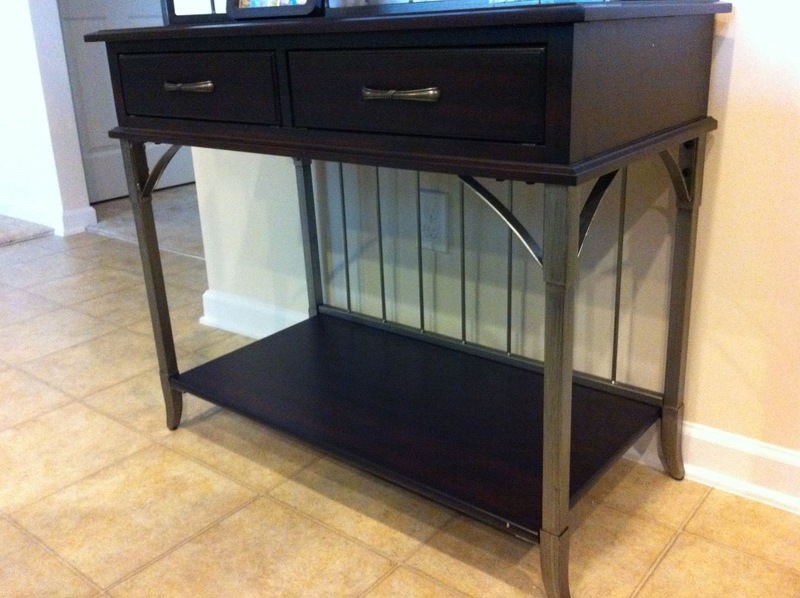 I spent some time Tuesday before work putting it together, but was only able to get the bottom buffet server piece completed. 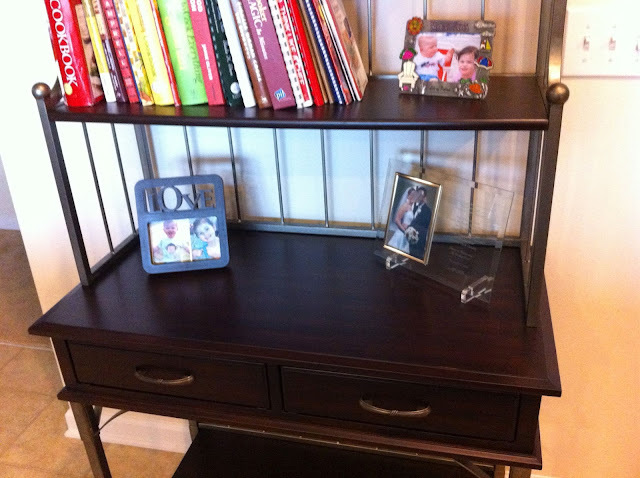 Then yesterday I was able to add the hutch to it and call it done! I will admit I was a bit disappointed with the color of the metal. On the website it looked straight up silver, but it's actually a brushed antiqued pewter finish. Not horrible enough for me to hate it, but definitely slightly annoying. I also decided that since I was putting it together, I could take creative liberties with the process. Since we are NOT wine drinkers, and I usually keep my cooking wine in the cabinet or fridge, I decided not to install the wine rack below the main shelf/drawers. I also chose to leave off the wine glass rack from under the top shelf as the only "fancy glasses" we have are essentially water goblets that I figured would be a bit too large for the rack. Once it was together, I started to gather items to put on it. Of course I started with my cookbooks, and was surprised to see that I didn't have quite as extensive a library as I thought I did. We're talking about half a shelf's worth. I was a bit surprised but honestly, I find so many of my recipes online these days that it makes sense. 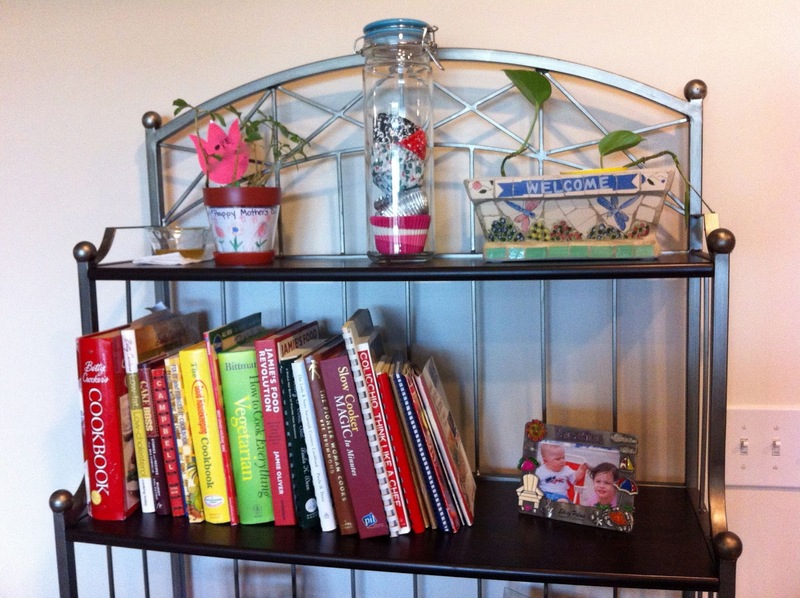 So next I proceeded to find some other knick-knacks and miscellaneous stuff to put on it. And I even admit, I googled "what do you put on a baker's rack" for more inspiration. 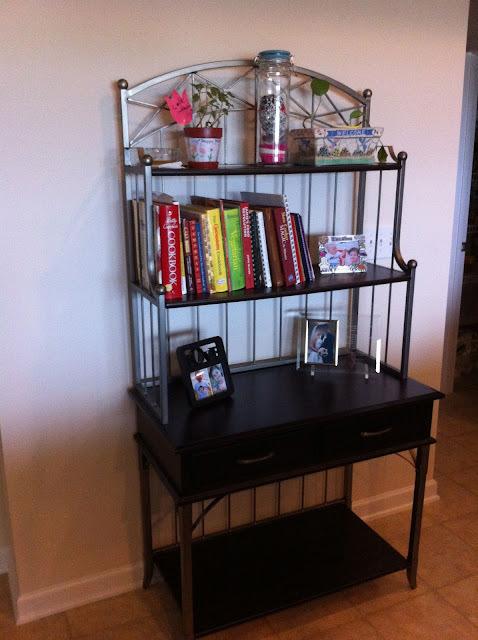 I might add a few more things to the main shelf, and grab my placemats & napkins to put in the drawers. But I'm not sure what to do with the bottom shelf. I don't really want to pull out actual baking stuff for it (such as my smaller Kitchen-Aid mixer or food processor or blender) since I have plenty of storage space for that stuff elsewhere. I'm leaning towards adding two wicker baskets to the bottom shelf, but again, I'm not sure what I'd store in them. Maybe some of the kids' baking tools and supplies? Geez. I didn't expect this to be such a challenge! At least it looks pretty, right? See how the finish isn't overly silver-y? Bummer. I'll probably find a few more things to add to this main shelf below the cookbooks. And finally, the sad, empty bottom shelf. 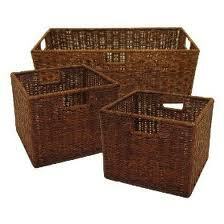 These are the kind of wicker baskets I was thinking about using on the bottom shelf. Still just not sure what to put in 'em. I'm super glad to have my Baker's Rack and I look forward to filling it up with handy, useful baking-related stuff!